Hørsholm, Denmark: – One of Europe’s leading laboratories in analysis of particle properties has discovered unexpected inconsistencies between the size of particles and their behaviour with significant implications for pharmaceutical safety and reliability. A team from the Danish-based contract research organisation (CRO) laboratory Particle Analytical ApS, has unearthed new insights about the relationship between the size of particles and their behaviours in tablets and powders. Karin Liltorp, Thomas Andresen, and Søren Lund Kristensen publish their findings in an article for the October 2013 issue of the leading industry journal Contract Pharma. Particle characteristics, including size, are immensely important in determining the behaviours and manufacturing quality of powder-based pharmaceutical products, both in relation to processability and bioavailability. Unfortunately particle size is not always easily controlled during manufacturing, and even slight changes in manufacturing conditions can lead to significant size changes. Furthermore, a change in API supplier will almost certainly lead to new particle characteristics. In all cases where the risk of change in particle size exists, you must evaluate whether the changes will affect the drug properties — and if the method used for characterization of the particles is still valid. A good method for characterization of the particles in a product should, among other parameters, be able to describe the product with regard to size. This appears to be a very reasonable requirement, but it is not always as simple as it seems. First of all, “size” is not easily defined: Is it the length, the width, the thickness or the shape that you want to know? Size and shape are related to various other parameters such as flowability, compressibility, and dissolution, and the correlation is not necessarily straightforward. Thus, validation of a method for determining particle sizes should optimally be correlated to these other parameters that are critical for the current product — blending properties, dissolution rate, agglomeration tendencies, etc. In this study, two batches of the same compound — from different suppliers and with quite different particle characteristics — were compared with regard to particle size and dissolution properties. One batch consists of small — and agglomerated — particles and the others of larger particles that do not agglomerate. In contrast to “expected” behaviour, the smaller particles dissolved more slowly than the larger particles — probably because of their tendency to agglomerate. In this case, the size of the primary particles, as determined by the validated particle size method, does not give a good description of the product behaviour. Thus, this example highlights the importance of correlating your method for determination of particle size to other critical parameters for the product. Two samples of compound X from different suppliers were examined by SEM (scanning electron microscopy), laser diffraction and dissolution. The chemical composition and the crystal form (as reflected by XRD) of the two batches are the same. Batch A consists of small primary particles building up large agglomerates (as seen from the SEM pictures in Figure 1 – left side). Batch B is made up of larger primary particles and does not agglomerate (Figure 1 – right side). The differences in particle size are further reflected in laser diffraction measurement: D90% is 19.7 μm for batch A and 51.9 μm for batch B (Table 1). These results confirm that the primary particles of batch B are larger and those of batch A. When determining particle sizes by laser diffraction, the particles are dispersed in a suitable medium (air or liquid). Usually the dispersion medium and mechanical conditions for the measurement (i.e. stirring/pressure) are chosen in order to obtain the “optimal” dispersion of the particles — i.e. usually a dispersion of the primary particles. 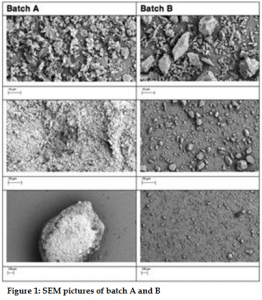 Thus, in many laser diffraction methods, the results reflect the size of the primary particles, but agglomerates are not detected, as they are dispersed by adding pressure, ultrasound or stirring. In this example it is quite clear that the particle sizes measured by laser diffraction are the sizes of the primary particles, as the quite large agglomerates for batch A seen on the SEM pictures are not reflected in the laser diffraction results. Now, the question is whether the laser diffraction method used for determination of particle sizes is reliable: Do the results actually reflect the product? The answer to this question is, “It depends.” If you want to know the sizes of the primary particles, the method seems to be very reliable. However, because of the existence of large agglomerates in batch A, it is quite likely that this batch would behave differently during processing than a product consisting of not-agglomerated particles of the same size. It might be relevant to test whether the agglomerates affect processability; if they do (which is very likely) it might be a good idea to develop a laser diffraction method that does not lead to breakdown of the agglomerates. As the laser diffraction results show that the particles of batch A are smaller than those of batch B, one would assume that smaller particles would dissolve faster than the larger particles: It turns out not to be the case. The dissolution rate in a buffer at pH 7 was measured for the two batches (Figure 2.) 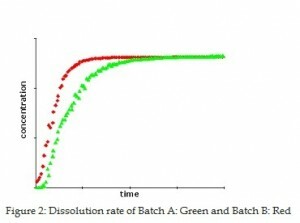 The results show that Batch B dissolves faster than batch A. The results indicate that a slower dissolution takes place for the smaller particles — which probably reflects that large agglomerates contribute to slowing down the dissolution rate. Thus, in regard to evaluation of the dissolution rate a more fulfilling description would have been obtained by “including” the size of the agglomerates in the laser diffraction measurement. These experiments illustrate the importance of correlating methods — and focusing on the purpose when developing a method for determination of particle sizes: Are you interested in the primary particles and/or the agglomerates? The tendency to agglomerate influences the dissolution rate — and it might further influence the manufacturing properties. Thus, a method validation should include correlation of particle sizes to other parameters — such as the dissolution rate, the water uptake or a specific processability parameter. In many cases it might actually be relevant to validate different particle size determination methods in order to be able to get a fulfilling description of the product in relation to different critical properties. If the manufacturing process changes, or if you change supplier, you will always observe a change in particle characteristics, either with regard to size or morphology of the particles. In these cases you must evaluate what impact these changes will have — not only on the particle size, but also on other critical parameters. Thus, you should reassure that the method you use for determination of particle sizes is still valid in order to describe the properties of your product correctly. Particle Analytical is a GMP contract laboratory that specialises in analysis of physical parameters of particles, powders or emulsions, using a range of advanced techniques. The Danish-based company is one of the few laboratories in Europe to offer a complete range of services dedicated to analysis of powders, including particle size, and all physical chemical properties. These services are primarily focused on the pharmaceutical industry, where particle and powder analysis are essential in controlling compound properties during development, both with regard to production process and to behaviour in vivo. Unique analysis services include determination of refraction index, fast compatibility screenings of excipients and determination of the percent crystallinity of samples. Particle Analytical’s leading-edge capabilities include laser diffraction, XRD, thermal analysis, dynamic light scattering, microscopy, BET, dynamic vapour sorption, density measurement and air permeability. The laboratory is fully certificated as cGMP compliant by the Danish authorities and is also registered with the US Food & Drug Administration (FDA). Particle Analytical services can either be used in routine analysis, separately to solve specific problems, or in parallel to larger drug development programs. Additionally, the laboratory can take on full responsibility for particle analysis. For more information about Particle Characterisation, please contact Particle Analytical directly.